The Oregon Ducks dispatched Duke in the Sweet Sixteen on Thursday, 82-68. Oregon’s last points came off a Dillon Brooks three, which he hit as the shot clock expired with eight seconds left in the game. He celebrated a little, because his team had just beaten Duke, but a bit of silly controversy broke out after the game. 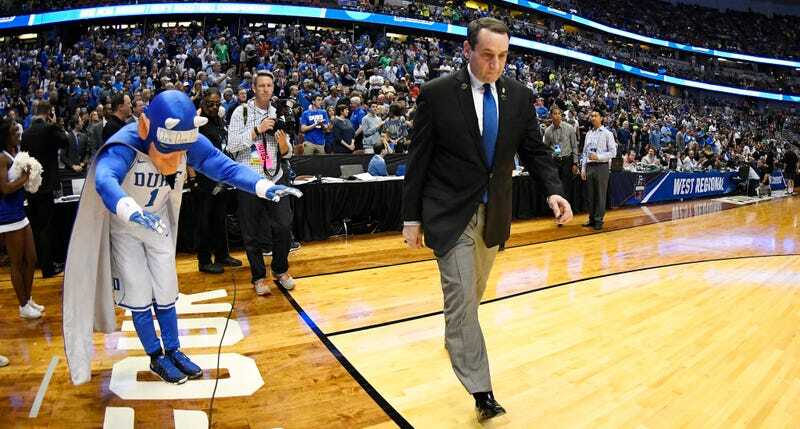 Brooks said Coach K lectured him about sportsmanship in the handshake line, but Krzyzewski denied it strongly. Even so, Brooks seemed gracious about it, Dana Altman took the blame, and nobody involved seemed to care too much. Turns out TBS cameras got video of part of the talking to, and it appears Brooks’ side of the story is the truth. Krzyzewski, who has a history of reacting poorly to losses, apologized for his pettiness this morning after the video came out, and said he “reacted incorrectly” to a question. In light of Krzyzewski’s apology, the Inside The NBA segment that lauded Coach K’s work as a Teacher and a Mentor Of Young Men for having the grace to put Brooks in line is pretty funny now. Now that Krzyzewski himself has scrambled to apologize after the video evidence shows that he lied, Inside’s effusive fawning over him looks all the more ridiculous. Anyway, Brooks, who is not a professional, had a pretty funny response to the this whole matter. Let us never speak of this dumb controversy again.